Our first home was high up on Mt Victoria, Wellington. The northern boundary had a row of 8 established Pohutukawa and after completing a number of DIY alterations to the house and grounds we planted a Kowhai by the front door. And every home we have owned since has had kowhais in the grounds. Building a new home in Havelock North we were able to layout the grounds from scratch. The section was as steep as Mt Victoria and we were able to get some trees established before the builders moved on site. We planted a variety of Kowhai down the hillside in front of the house which showed their gorgeous yellow colour for as long as possible, from July through to October. 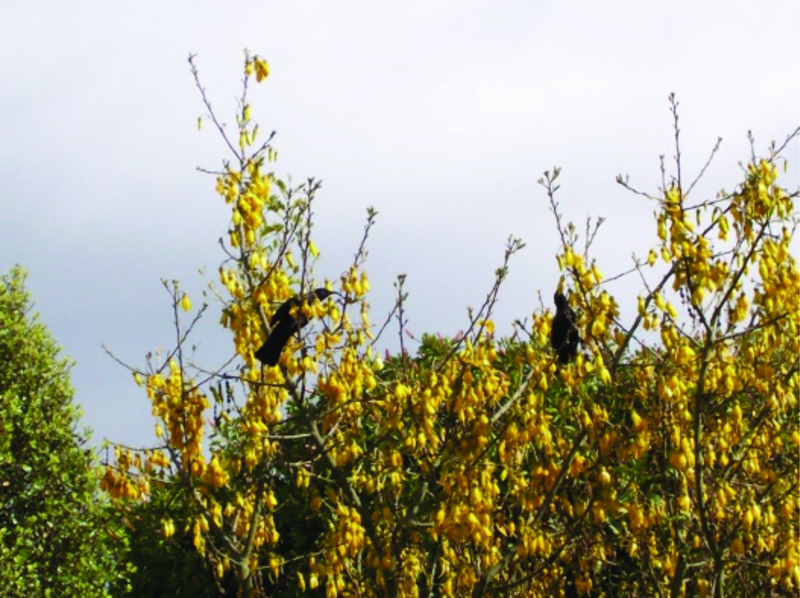 And, as the trees grew along came the tuis and bellbirds to gorge on the nectar. The kereru flew into high gum trees nearby and occasionally came down into our section to feed. We had this property for 21 years and our selection of natives was well established, eventually limiting our view to the ranges and Mt Ruapehu. The colourful aspect of the landscape of our own section more than compensated. Other plantings included Karaka, Lemon wood, Pohutukawa, Putawetaweta, Melicope and Whau. It is the spectacular burst of yellow that immediately identifies the Kowhai. Most species are semi-deciduous and allow light into the garden during the winter. 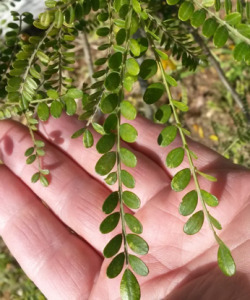 The tiny leaves of the Sophora microphylla are about 1/5 the size of its cousin the Sophora tetraptera making the foliage itself stand out in your garden. 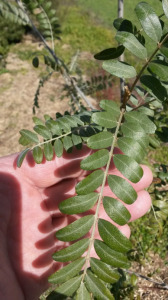 In amongst trees the Sophora Prostrata is a smaller denser bushy shrub. The Kowhai grows throughout New Zealand appreciating the cooler climate. We have seen them at Martins Bay in the Fiordland National Park. They are very common in the Taupo district and there are trees in the botanic gardens that we have seen hosting up to 30 tui enjoying a feast oblivious to the proximity of bird watchers. Hospice New Zealand has adopted the Kowhai as its national emblem along with their “living every moment” by-line. The Kowhai bark was widely used by Maori for its medicinal benefits. Kowhai prefer to grow in full sun and need good drainage. The Kowhai moth can cause considerable damage but in healthy trees the defoliation is only temporary. Our grandson picks up the little hard seeds and has taken them back to Wellington to germinate and plant. Mike Halliday (via Wikipedia) continues…… Sophora  is a  genus  of about 45  species  of small  trees  and  shrubs  in the pea  family  Fabaceae. The species are native to southeast Europe, southern Asia, Australasia, various Pacific islands, western South America, the western United States, Florida and Puerto Rico. The generic name is derived from  sophera, an Arabic name for a pea-flowered tree. The genus formerly had a broader interpretation including many other species now treated in other genera, notably  Styphnolobium (pagoda tree  genus), which differs in lacking  nitrogen fixing  bacteria (rhizobia) on the roots, and  Dermatophyllum  (themescalbeans). The New Zealand Sophora species are known as  Kowhai. The  Toromiro  (Sophora toromiro) was formerly a common tree in the forests of  Easter Island. The tree fell victim to the deforestation that eliminated the island’s forests by the 18th century, and later became  extinct in the wild. The tree is being reintroduced to the island in a scientific project partly led jointly by the  Royal Botanic Gardens, Kew and the  Göteborg Botanical Garden, where the only remaining plants of this species with a documented origin were propagated in the 1960s from seeds collected by  Thor Heyerdahl. 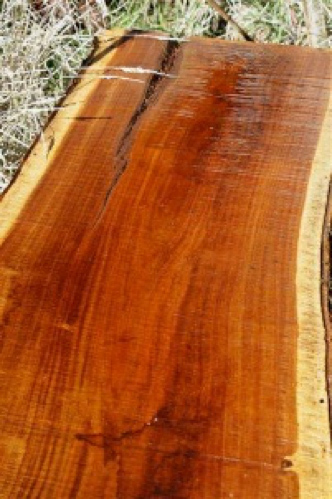 Kowhai timber showing distinction of heart and sapwood. The bark of the Kowhai was used in a medicinal way by Maori to cure skin ailments, wounds and bruising. The great All Black George Nepia is said to have used it in 1925 to heal a blood clot in his leg, and was back playing the next week – fast forward 90 years to a current All Black from Fiji also using traditional healing! Kowhai timber is tough, dense and durable, with the heartwood a yellowish-brown with dark streaks, and has been used by both Maori and European settlers for tools, building piles, wedges, as well as decorative uses. Interestingly all parts of the plant are quite toxic (contains Cytisine), and have been known to cause illness when used as cutlery or bowls. The flowers were used for a yellow dye. Seven provenances of Kowhai have been planted in the New Zealand geographic section of the arboretum. References: Wikipedia; N.C. Clifton, New Zealand Timbers.